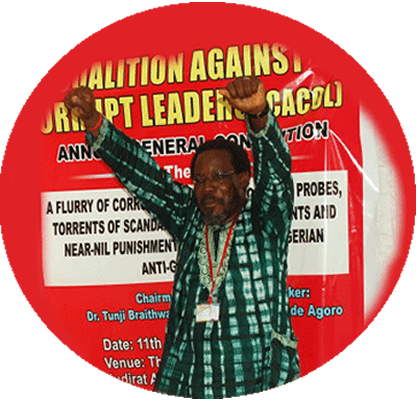 Our organization, the Centre for Anti-Corruption and Open Leadership, CACOL is up till December 28, 2016 known as Coalition Against Corrupt Leaders. CACOL is an aggregate of human rights, community based, and civil society organisations and individuals with anti-corruption and openness in governance agenda across Nigeria. It is a non-political, non-religious, non-sectarian, non-profit organisation. Your Excellency, CACOL, heartily welcomes you back to active duty like all well-meaning Nigerians after your last trip for medical care in the United Kingdom; we also wish you full recuperation soonest. Indeed, the significance of your return at this auspicious time needs not to be over-emphasized given the state of the nation upon your return and arduous task ahead. Your Excellency, we find it pertinent to call on you to urgently take steps to make some changes in the Federal Cabinet to reinvigorate the processes of governance on one hand and delivery of service to the people on the other. Glaringly, after about two and a half years since the inauguration of this government, certain patterns have unfolded that has exposed mediocrity and incompetence within the ranks of the cabinet members with regard to their performances in lines of the duties assigned to them. This is reality is necessarily telling on the general performance of the government itself wholesomely. Mr. President, in making our call for these expedient changes in the cabinet, we equally want to crave your indulgence to make our recommendations in terms of clearly nonperforming or ineffective Ministers. We recall that at the end of your first year in office, you sought for the opinion of the public on whether there was the need to make some changes in the cabinet which demonstrated your openness to accommodate views and make good use of them. 1. The Federal Ministry of Power, Works and Housing: The Ministry superintended over by Mr. Raji Fashola, (SAN), have over the past years made more noise than any practical achievement on the ground to justify the funds that has been ploughed into the three sectors under it. All the actions and policies of the Ministry have compounded the sufferings of Nigerians in multi-folds; from lack of power supply to the illogical hike in electricity tariffs, from continually decaying infrastructure to death traps as roads with a Housing sector that is ‘non-existent’ or in absolute comatose. The Minister is constantly at loggerheads with institutions, contractors and even the citizenry he is supposed to serve. The Minister keeps standing logic on its heads by asking the already impoverished Nigerians to bear the brunt of his failure by asking them to pay for services not rendered even up to the effrontery of hiking the tariff of electricity against a background of a country in perpetual darkness. He made history by achieving the lowest, ZERO, mega watts for more than 18 hours in history of power generation in Nigeria last year; with nothing to offer than damage, we call on Mr. President to ask him to honourably resign or he should be sacked! 2. We recommend the immediate replacement of Mr. Malami Abubakar as the Attorney General of the Federation and Minister of Justice of this country to save this government and the country from further embarrassment and criticisms within the comity of nations. The mantra of this government and one of the campaign cardinal points of its party is ‘fight against corruption’. For any government to succeed in its policies, programmes and agenda, the commitment, professionalism, soundness and integrity of the Chief Law Officer of that government must be impeccable and consistent. We are afraid, based on recent happenings, the current Attorney-General and Minister of Justice has fallen short of these critical requirements and incapable of delivering any fundamental departure from the corruption ridden past of governance in the country. We noted the AGF’s unnecessary interventions particularly in cases high profile publicly exposed persons and the needless ‘rivalry’ with the Economic and Financial Crimes Commission, EFCC, an agency under his Ministry and which ordinarily reports to him officially. The Attorney-General was publicly accused of meeting, negotiating, agreeing terms and collecting N50 billion on behalf of the government without recourse to both the regulatory agency and supervisory ministry last year. Local and international criticisms greeted the unprofessional conduct of the Minister and secrecy associated with his negotiation with MTN. These reasons, amongst others necessitate our call for the removal of the AGF and Minister of Justice. 3. The Minister in charge of the Federal Ministry of Finance and Economic Development, Mrs. Kemi Adeosun has been everything but impressive and constantly appears to be confused on policies and in-depth economic management. The economic terrain under her watch is riddled by contradictions, policy somersaults and uncertainties. It is our conviction that it is the concerted efforts of the Central Bank and other MDAs trying to diversify, particularly the Agriculture Ministry and with the increase in the price of oil that helped pulled Nigeria out of recession recently and not via the acumen of the Finance Minister. We recommended that she should be replaced with better competence and prowess. 4. The Federal Ministry of Petroleum Resources under the superintending Minister of State, Dr. Ibe Kachikwu has no concrete achievement to showcase 2 years after the inauguration of this government. All the lofty promises of performance including making the refineries functional within 6 months and building of new ones given by the Minister at the assumption of duty has fallen flat on their faces, just as Nigeria sadly still import refined petroleum products. At this rate, this situation will persist till this tenure lapses, which will be totally unfortunate and unacceptable, thus it is time to replace the Minister for someone with greater acumen, necessary will and skills. 5. Quintessentially, we call on you, Your Excellency to relieve yourself of the position of the Minister of Petroleum Resources immediately. This is allow you to concentrate fully on the wholesome administration of the government which clearly can only be done conscientiously by your esteemed self and against the background of a National Assembly that apparently lacks diligence in its oversight functions preferring the mundane for the significant, it becomes expedient. We urge that you concentrate your energy on supervisory roles over all Ministries and the Presidential leadership of the country while a substantive Minister is appointed for the Petroleum Resources Ministry. Your Excellency, as a matter of fact we recommend changes in almost all other Ministries; they are either prostrate or in comatose, some are even approaching non-existence in status. Nigerians can hardly tell what the Ministries of Education, Health, Aviation, Commerce and Industry, Solid Minerals Development etc. are doing in these very challenging times for the country. They all appear to have gone to slumber following the lack of clue on what to do. Finally, Mr. President, we call on your good office to look into the activities of the National Inland Waterways Authority, NIWA with a view to making changes in the current leadership as they have continually failed in preventing incessant flooding across the country that has accounted for some many losses of life and properties. The NIWA is responsible for surveying, removing, and receiving derelicts, wrecks and other obstructions from in land waterways across the country by the Act that created it; why should be experiencing floods at the same locations repeatedly over the years if the Authority had been up and doing in terms of its duties? The leadership has definitely failed in designing anticipatory and preventive plans which would have forestalled avoidable disasters. Once again, we say welcome back, Your Excellency; we wish you more energy, courage and strength. Previous articleDebo Adeniran: June 12 election truly free and fair?